Beautiful studion apartment in top location with sea views and garage. 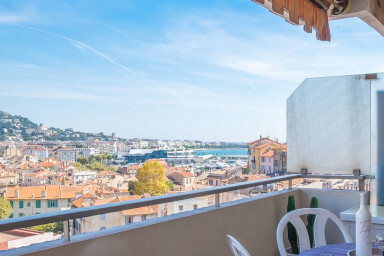 With a beautiful view, overlooking Le Suquet (old town Cannes), the sea and the entire Cannes in the background, this is an apartment to really enjoy life on the Riviera. The apartment is newly renovated and tasteful decorated and furnished. The bed is a cabinet bed, making the apartment feel spacious during the day. We believe that the apartment is best suited for a couple or for a person who is in Cannes for the congress. The balcony is large and spacious with access from the large glass doors. Fully fitted kitchen with all you need for your stay. There is of course wifi and air conditioning. The apartment is situated in a well maintained building just on the edge of Le Suquet (Cannes old town), only few minutes walk to the beach and less the 10 minutes down to the Palais des Festivals and the Central Croisette area of Cannes. Ideal for someone attending congresses or a couple on holiday. You have the same short distance to Quai Saint-Pierre that is an excellent spot to explore the maritime side of Cannes.